Galway East Tourism - Ballinsloe Horse Fair in East Galway, West of Ireland.Galway East Tourism - Ballinsloe Horse Fair in East Galway, West of Ireland. Held within the first 2 weeks of October, this popular festival is a must for horse lovers and is one of Europe's oldest horse fairs. Activities include horse sales, competitions, exhibitions and entertainment for all ages. 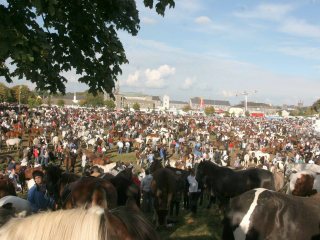 The Ballinasloe October Horse Fair & Festival this year takes place from October 4th until October 12th 2008 in Ballinasloe, Co. Galway. Known as the gateway to the West, Ballinasloe is situated on the N6, main Galway - Dublin route. This year?s festival committee have begun programming a wonderful nine day festival, guaranteed to have something for everyone. From the equestrian events which will take place on Sunday 5th October, Monday 6th October and Saturday 11th October. There will be music on the streets both weekends, street entertainers and indeed our traditional La Gaelach on Saturday 11th October. Throughout the week, the festival have programmed a number of activities with the local schools and we look forward in having the future people of Ballinasloe fair get involved in music and crafts. It is estimated that the fair & festival is worth in excess of ?8.5 million to the local economy and the multi nationalists that attend as well as our local community accumulate a total audience of approx. 85,000. We hope you get the opportunity this year to visit Europe?s Oldest Horse Fair and look forward to meeting with you in Ballinasloe during the nine day event.